Headlights are one of those things that you rarely think about, because they're just sort of there. The basic technology behind headlights hasn't changed in decades, and even fancy newer systems like adaptive headlights aren't flashy enough to get much attention. When your headlights suddenly stop working, things can get very dangerous in a big hurry. But headlights can also fail in the other direction. Far from a fail safe, headlights that won't turn off, no matter what you do, can quickly drain your battery and leave you stranded. 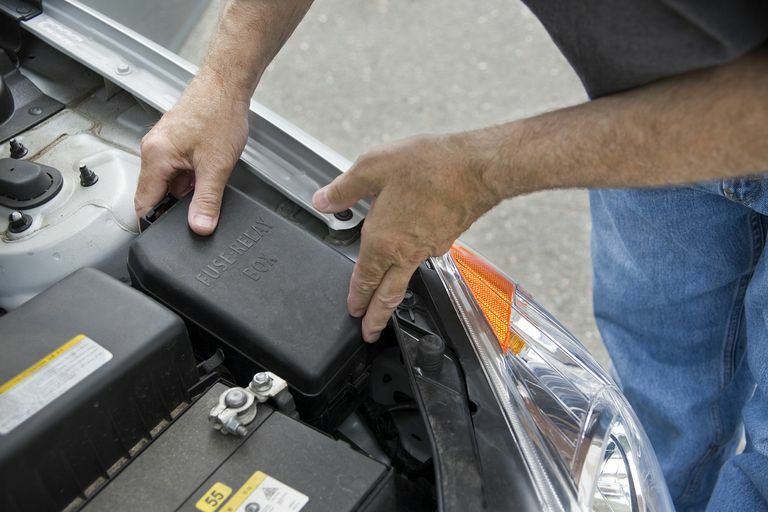 See the next section for information about safely disconnecting a battery. Your headlights should now be disconnected. Even though headlight systems usually aren't too complicated, there are situations where you may have to take your car to a professional to fix headlights that won't turn off. But before you do that, there are a handful of things that just about anyone can check at home with some basic tools and a methodical process. If you don’t have time to tackle the problem right away, or you just want to be able to leave the car for a while without the battery dying, there are two different ways to keep the headlights from killing the battery. The easiest way to keep the battery from dying is to disconnect it. This involves literally disconnecting one of the battery cables from the battery, which requires an appropriately sized wrench or socket. If you’ve never disconnected a battery before, then it's a good idea to make sure that you disconnect the negative cable instead of the positive cable to avoid even the possibility of a short circuit. The negative cable is typically black, while the positive cable is typically red. You can also look on the battery itself for a - symbol, which will be near the negative terminal, and a + symbol, which will be near the positive terminal. After disconnecting the negative battery cable, make sure to move it away from the battery so that it doesn't get nudged or bumped and come back into contact with the negative battery terminal. Once the battery is disconnected, the headlights will turn off, and the battery won’t die. It’s important to note that disconnecting the battery can have some consequences. The memory of your onboard computer will be wiped out, so it will have to go through a “relearning” process that may impact fuel economy for a short time. You also won’t be able to go through emissions testing in places where they read the codes as part of the test since it will show that the battery was disconnected. If your car stereo has a security feature that requires a special code after a loss of power, then you’ll also want to make sure you find your car radio code before you disconnect the battery. The other way to shut the headlights off is to remove the appropriate fuse or relay. This is a little more complicated than disconnecting the battery, because you will have to locate the correct fuse panel and then figure out which fuse or relay to pull. This will prevent a loss of power to the computer and radio, though, so you won’t have to deal with any fallout later on. What Can Cause Headlights to Stay On? The matter of actually tracking down this type of problem can be complicated, because there are so many different types of headlight systems out there. For instance, some cars are designed so that if the engine is shut off while the headlights are on, they will remain on for a specific amount of time. If you have one of those cars, that system may have failed, and you might want to try shutting the headlights off before turning the engine off to see if that helps. Other cars have daytime running lights, which is essentially just a system that automatically turns the headlights on—but doesn’t affect the dash lights—during the day. If that system fails, it may cause the headlights to remain on. In that case, you can try setting the parking brake to see if that shuts the headlights off, as setting the parking brake typically disables daytime running lights. If that’s the case for you, then removing or replacing the daytime running light module will probably fix your problem. If a bad headlight relay is a reason that your headlights won't turn off, then the fix there is also to just replace the relay. This is actually a little easier to check yourself in a lot of situations, since there's a chance that multiple circuits may use the exact same type of relay. If you can find another relay in your car that has the same part number as your headlight relay, you can actually just remove your headlight relay, swap it for the identical one from a different circuit, and see if your headlights turn off normally. If the headlights turn off, then you just need to buy and install a new relay. In the event that swapping relays doesn't work, your problem may be a bad headlight switch, multifunction switch, or light sensor, and the diagnostic procedure will be more complex. You may be able to identify the problem by simply removing the component in question and checking for physical damage, but there won't always be physical indicators. For instance, a bad headlight switch that's shorted internally may get hot enough to crack, melt, or even burn the plastic housing or electrical connections, but that isn't always the case. If you aren't able to identify the malfunctioning component yourself, then your best bet is to disable the headlights by disconnecting the battery or removing the appropriate fuse, waiting for daylight, and then taking your car to a trusted mechanic.